After spending over six months in Africa, we're well acquainted with the continent. 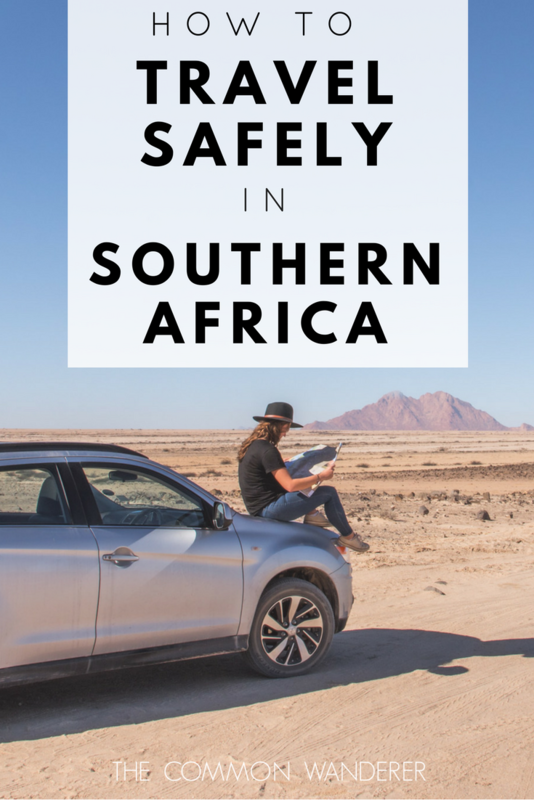 Here are the most important safety tips we discovered on our travels, to help you avoid becoming criminal fodder, or the latest victim of Africa-belly. It’s sad, but after travelling extensively through central and southern Africa, the most common question we’re asked to this day is not “how beautiful is it?” or “where should we go?”. In fact, most people we mentioned our Africa travel plans to would stare back at us, wide-eyed and aghast, before leaning in close to whisper knowingly behind their hands ‘yes, yes… but are you sure that it’s safe?’. In some ways we get it. After all, years of television coverage has painted a pretty bleak picture; all big bellied starving children, brutal war lords, disease and famine, poverty and poaching - and yet, this comment always makes us laugh / sigh. We can’t deny the continent’s seen a few issues here and there, like everywhere on earth, but honestly, having travelled pretty extensively through Africa now we’ve gotta tell you; we never felt in any more danger travelling here than we would anywhere else in the world. Heck, after all, eight of the worst 10 cities for pickpocketing are in Europe. And no African countries even rank once! That said, as with all travel: when you’re a tourist, you do stick out quite clearly as a potential easy target, and need to take a few extra precautions to keep yourself safe. Here are the tips for Africa travel safety we discovered on our travels, to help you avoid becoming criminal fodder, remaining scam savvy, or the latest victim of Africa-belly. Keep in mind that even if you’re a struggling uni student, horrible with money, or eternally broke from buying all the things - the fact that you can afford to come here for a holiday means you’re probably earning a lot of money in relative terms. Flying under the radar = staying safe. Pretty much, the guy flashing his wallet full of cash, waving his expensive camera in full view, or wearing more bling than a Kardashian is likely to lose one or all of these things at some point. - If you’re a passenger in a speeding vehicle, it’s okay to say ‘slow down’. Reckless driving is common! the ins and outs of south africa: IS SOUTH AFRICA SAFE FOR TOURISTS? Scams are unfortunately common everywhere in the world, and if you haven’t already encountered one from a rich Nigerian relative you’ve never heard of seeking your bank details to transfer your ‘inheritance’, chances are you’ll encounter one face-to-face travelling through Africa. The most frequent - and irritating - scam of them all is credit card fraud - which we were the unlucky casualties of in South Africa (a whole lot of hassle and the temporary loss of $1500 sure put a dampener on that week!). Always cover your pin number and only get money out from reputable banks. - Calculating a taxi fare at the end of the trip. Always, always, always agree on the price when you first get in (we’re looking at you, man who tried to scam us out of $30USD for a 5km cab fare in Malawi!). - Selling fake products or tickets at inflated prices. Always buy your bus tickets at a reputable company! - Extra payment for storing baggage on bus rides. Never pay this - your ticket includes all baggage. The rule of thumb here is “if it sounds too good to be true, it is”. Live by this, and you’ll quickly realise just how many little tricks there are to catch unassuming tourists! Do you know your Uganda from your Congo? Namibia from Somalia? What about the risks associated with visiting each? Across a continent as vast as Africa, overall safety differs from country to country, region to region and even town to town. Which means it’s vital to do your research before you arrive in each new place. While most countries in southern Africa are well developed and completely safe for tourism - as long as you don’t stray into townships, or walk around at night by yourself (which is obviously silly) - some central and northern African countries are a little more complicated or politically unstable. Your relevant government travel advisory warnings, guide books and trusty all-knowing Google are some of the best sources of information, while chatting with fellow travellers or expats gave us the most up to date, on the ground info as we needed it. No, really. Just don’t. No one likes getting weird illnesses when on holiday but getting sick in the middle of rural Africa isn’t just a blow to your plans, it’s dangerous. Health services vary greatly through the region; more developed countries have brilliant hospitals, rural areas sometimes struggle to provide you with much more than a drip. Throw in a lovely tropical illness like Malaria, and you’ve got yourself a bad sit! To stay healthy in on your African adventures you need to be thinking of your health well before you leave for the airport. Almost every African country requires proof of Yellow fever vaccination, while Hepatitis A, Rabies, Typhoid, Meningococcal meningitis are all pretty common jabs to get. Despite what you may thing, you can drink the tap water in southern African countries like South Africa and Namibia (apart from some rural areas). The further north you go you’ll need to start dropping some iodine tablets in (or boiling the water) just to be safe. We do recommend staying clear of bottled water (use this Water2Go bottle instead! ), purely due to the amount of plastic waste which is dumped by the roadsides. Plastic waste and recycling is big problem in Africa. When it comes to food, Africa is the only region that neither of us have ended up with food poisoning in before - the quality and prep standards are that good. Or our guts had got really strong by that stage! Honestly, the food is very well prepared, and often simple; think rice, beans, spinach and tomato. That said, we do generally steer clear of meat once we’re in the more remote areas due to a lack of electricity and proper refrigeration. While African street food isn't anywhere near as good as South-East Asia or Europe, it's well worth trying. Just be careful. If you're visiting southern Africa and you are worried, your safety comes down to exercising that little thing your mum used to tell you about called common sense. Would you wander around at night by yourself in your own city with your valuables out on display, and expect that nothing untoward would come of it? Probably not. Be aware, but not afraid, and you’ll soon find yourself having the time of your life enjoying incredible Africa for what it is, rather than worrying about becoming a victim. Sometimes, despite your best efforts and planning, things go wrong. And if they go seriously wrong and you haven't taken out proper travel insurance for your trip, you're likely to find yourself in debt, lacking medical cover, or worse. Read our in-depth travel insurance guide to help understand why it's so important. We can't recommend travelling through Africa highly enough, but we know it can be daunting. If you have travelled through southern Africa, leave your best tips below? And if you're keen to travel through Southern Africa but are worried, ask us ANY question!